Evidence from the 2001 anthrax attacks is going on public display at the Smithsonian Institution. 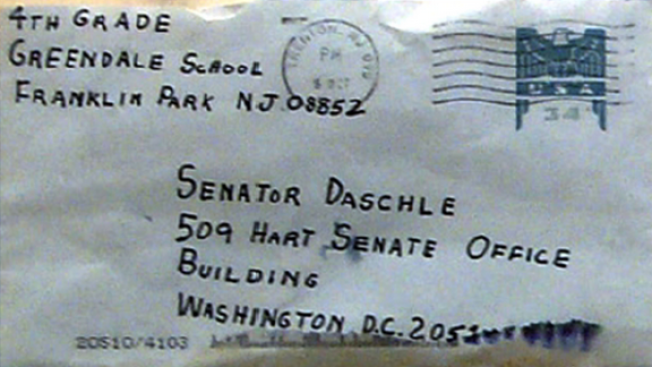 The new exhibit at the Smithsonian's National Postal Museum includes an anthrax-laced letter sent to Sen. Tom Daschle in October 2001, less than a month after the 9/11 attacks. The letter is on loan from the FBI. Examination of the letter and the decontamination process left it nearly illegible. The museum also is displaying the mail collection box from Princeton, New Jersey, where the anthrax-laced letters were deposited. The exhibit opened Friday and details the work of the U.S. Postal Inspection Service. "Behind the Badge" explores the history of one of the nation's oldest law enforcement agencies. Visitors will also see a memento from another high-profile case: the handcuffs used to arrest unabomber Ted Kaczynski.